Biomolecules labelled with our photoluminescent nanocomplexes are rendered conspicuous on the crowded background of cell and biological tissue, as long as their optical signal is discriminated from that of the biological tissue. As an example, consider three imaging scenarios, as shown in Figure 1: (a) Luminescent ruby nanoparticles are internalised in Cheek Hamster Ovary (CHO-K1) cells whose membrane is stained with bright quantum dots. Apparently, nanorubies (if any) are heavily overshadowed by the quantum dot luminescence and cell autofluorescence. (b) Spectral filtering helps to suppress most of the background, but nanoruby signals are still ambiguous. (c) Time-gating the nanoruby signals from the background signals making use a million-fold greater emission lifetime of nanoruby results in complete suppression of the background, so single ruby nanoparticles are clearly observable. Figure 1. Fluorescence laser scanning confocal microscopy images of CHO-K1 cells treated with both Qdot 605 quantum dots and the as-synthesized nano-ruby particles without time-gating or spectral filtering, (a), with a 650 nm long pass filter, (b), and with time-gating enabled, (c). In the case of spectral filtering only, the staining from the quantum dots is still evident, whilst this is completely suppressed in the case of time-gating . We have demonstrated these ultrahigh-sensitivity optical detection methods for the imaging of quantum dot nanocomplexes target-delivered to the CHO-K1 cells, where a novel two-step in situ protocol proved to be successful . Figure 2. Fluorescence confocal images of cells treated with (left) targeting biomolecules (short peptide, somatostatin), and (b) blank negative control; followed by the incubation with the quantum dot (QD) biocomplexes at low temperature and brought to room temperature. QD and somatostatin were joined by a somatostatin:biotin molecular linker, as described in Stream 2. 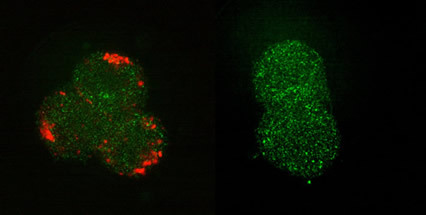 The QD-fluorescence is colour-coded red and the cell-morphological contrast, originated from laser back-scattering, is coded green. Upconversion nanoparticles bioconjugated with the specific mini-antibodies and specifically immobilised on breast adenocarcinoma cells allowed almost complete suppression of the cell autofluorescence background by simple spectral filtering means, as briefly described here.